Have you ever had grand dreams of a beautiful garden, but it never went exactly the way you imagined? Maybe you thought you planted lettuce, but it never came up. You were sure it was time to harvest the carrots, but they were too tiny when you pulled them up. There’s a simple solution to these types of problems. Plan your garden before you plant it. Planning a garden allows you to prevent mistakes from happening in the first place, and keeps you on track for the whole year. I’ve never been great about planning or keeping notes about the garden. It shows too, in my haphazard way of putting seeds in the ground. Some years I luck out. Other years I put in a bunch of work only to have nothing to show for it at the end. I’m sure if I were better at planning and note taking I would have better yields. 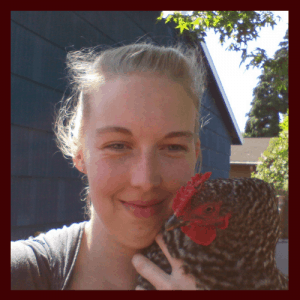 So, when I got a chance to receive a review copy of The Gardening Notebook by Angi at SchneiderPeeps I jumped at the chance to increase my knowledge. It’s such a good resource for keeping track of my plans and notes! After you’ve cleaned up your garden for the fall is the best time to start planning for next year. Look over any notes you have, or just use your memory if you don’t have any yet. What did well this year? What was a total failure? Do you know why? (For me it’s usually a watering issue…) Where was everything planted? Sketch out a basic map of your garden and jot down where you put everything this part year. One of the many printables in The Gardening Notebook is a graph and example to help you plot out your beds. Next make a new blank one for the upcoming year. This will help you plan out how to rotate your crops so you don’t accidentally create a disease problem. Next, list the things you would like to plant. Pick ones you’ve had a successful time growing in the past. For me that means kale and chard. The other best crops to choose are ones that you like to eat and are more expensive to buy organically. Look at your graph of your garden and decide where you can grow each crop in the spaces you have available. Write it down! Because if you are like me, you’ll forget. Finally, figure out the planting dates for each crop based on your first and last frost dates. If you need help with this, The Gardening Notebook includes information sheets on individual crops, as well as a chart of frost dates, and a calendar where you can write it all down. Making monthly task lists is a good way to keep yourself organized and make sure you don’t miss something important, like when to start your seeds indoors. Each month check your task list and schedule dates and times to complete each time. Now that you’ve planned out your year, it’s time to order your seeds, schedule next month’s task list, and relax a little before spring. Congratulations! 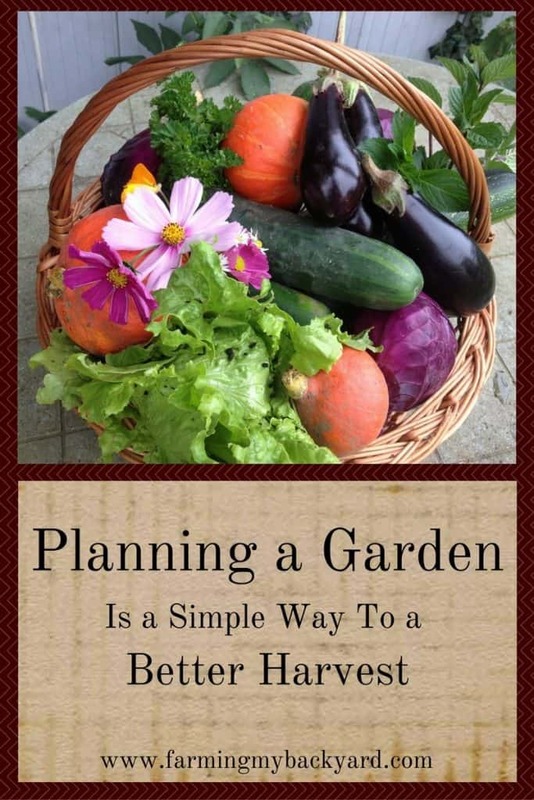 By planning a garden before planting, you are on your way to a better harvest! Spring can get really crazy. There’s getting seeds started indoors, hardened off, transplanted outdoors, or planted directly into the garden. The most important thing you can do during this season is take lots and lots of notes. Pull out your plans you made in winter and take a few seconds to write down what day you planted each crop. Note on your calendar when the expected harvest dates are. This will come in super duper handy a little later in the season when it comes time for succession planting. I knew succession planting was a great way to get more vegetables in a small space. Unfortunately, I wasn’t exactly sure how to start DOING it. After reading Angi’s suggestions on succession planting I feel like I will be better able to implement it in my own garden. I hadn’t realized that you can actually pull out a crop that’s nearing the end of it’s harvest to get the next one going. Duh! Without a place to jot down notes and dates specific to my own garden it seemed like too much information to keep in my head. With the expected harvest date written down, I can now plan in advance to have something ready to go into that spot. Maybe really experienced gardeners have a feel for these sorts of things in their head, but us newbies need a system. When I first read through The Gardening Notebook I had been wondering if it’s too early to harvest my kale. Sure enough, it was time. Instead of guessing, I had the notes I needed to know for sure. Summer is less intense than spring, but you still need to keep jotting down notes. As you keep an eye on each crop, write down some reminders of what has been working and what has had problems. If you have pests write it down, because when you go back through the next winter it’s going to help you prepare better for next year. What symptoms have you noticed? Did any treatments help? What crops were affected? When you harvest, note which plants did the best and which ones didn’t. If I had started doing this when I first started gardening, I would have realized my squash was getting powdery mildew. I had never seen it before, and didn’t know what it was at the time. I was mystified as to what was happening with it, how to prevent it from occurring again. And I certainly didn’t know what I had done that was encouraging it. When you know what types of problems you are likely to encounter for sure, you can make a plan to prevent them the next year. Maybe you need to add some plants to attract beneficial insects to eat your pests. Maybe drip irrigation would help prevent mildew. Now you know and plan in a time to make it happen! With all the notes you kept this gardening season you can add in some projects that will make your garden better. Perhaps you’ve been thinking about adding another garden bed. Maybe you discovered that by managing the garden space you have in a better way, you’d rather not expand. If you know the frost and harvest dates for your crops in your area, you can plan to add harvest extenders such as cold frames or plastic tunnels to extend the garden season longer for you. Fall is also a good time to add in more perennial plants such as fruit trees. Use your map of the garden you created when planning the garden at the beginning of the season to pick the best place to plant. As you harvest and put crops into storage makes notes of the dates and methods you have used. As you begin to eat them you can go back and look at which varieties stored the best. When you order seeds in the winter, you can order varieties that are better keepers. If you preferred a certain storage method over another, write that down too. If you prefer frozen green beans over canned, just take canning off your to do list next year. When I first started gardening I would read about the different things I was supposed to know, such as planting dates, frost dates, and crop rotations. I would jot down notes for myself, but they weren’t organized or all in the same place. If I ever needed to look back at something I usually had no idea where I had saved it. I highly suggest keeping all your notes in a central location. This could be a notepad, three ring binder, or file on your computer. If you decide to go with The Gardening Notebook there are lots of pages to print and jot down notes. For example, there are printable sheets for each vegetable including planting information, facts about the plants, helpful tips for common problems, and room for your own notes such as your favorite variety and planting dates. It’s like a cheat sheet for vegetables and includes tips and when to harvest, even storage tips for some vegetables. It’s great for gardening newbies like me, but it also great even if you are more experienced. Check it out, it may be just what you need to get more serious about gardening. No matter how you decide to record your notes, planning a garden ahead of time will help you become a better gardener and allow you to grow more food in the space you have. Thanks so much for the review, Kathryn. I’m so glad you are enjoying The Gardening Notebook. Also, thanks for mentioning the broken links. I was able to fix those this morning.